Like many other Asian countries, India is known for packaging tourist attractions differently for foreigners and locals. The tickets for some tourist attractions come for the price of a guesthouse room. The overpricing for numerous services results in the frustration of the travelers and desire to escape the capital as soon as possible, despite it is a hub of architectural and heritage sites. After living in this city for two years I would like to show you great places and activities you can do in Delhi for free. If you are traveling on a budget, I hope this will be helpful for you. I’ve started with spirituality since I am fascinated by the temple diversity in Delhi. India is a land of many Gods and you will find numerous religious institutions in the capital. There are many big and world known temples as well small yet beautifully designed and with its own traditions. Akshardham is a number one place I recommend to people who have visited me. The small details of the architecture and the atmosphere are so different from other places in Delhi. Moreover, this place is a digital detox from a big city life since any technological devices are not allowed inside. You can enter the temple and explore the whole territory of the complex for free. 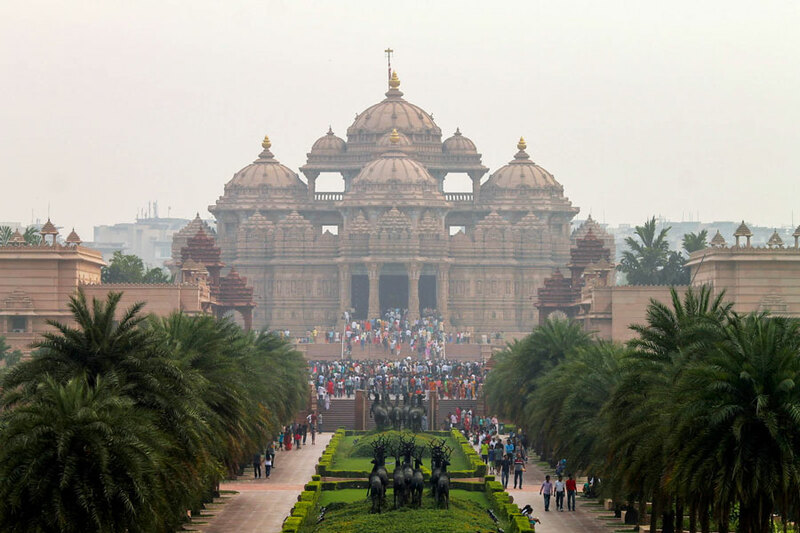 Akshardham also offers several cultural programs that come at a very affordable price. I definitely recommend the light fountain show even if you don’t understand Hindi. It costs 80 INR (1.2 USD) and looks very impressive. I’ve visited Akshardham numerous times and it’s a place which I always discover from a new angle. Etiquette and rules: Cameras and other technology are forbidden on the territory of the temple and garden. You will need to disconnect and deposit all your devices at the storage place near the entrance. Expect to spend around 40 minutes in the queue. How to reach: Metro is the easiest way. There is an Akshardham station on the blue Dwarka-Noida metro line. There is a 10-minute walking distance from the station to the entrance. What else: If you come without any devices, it will significantly save your time in the deposit room. You will need to take off your shoes before the entrance. There is also a canteen on the territory, where you can have a delicious lunch or dinner. I recommend visiting around 4-5 pm in the evening, depending on the season, so you can explore the gardens during 1 hour and attend a light show afterward. Fascinated by intricate architecture and designs? Check also Hoysala architecture in Somnathpur. This temple is one of the visit cards of Delhi. You can see it on the tourist websites, brochures, and guides. It’s a very calm place for meditation. You have to be really quite while walking and even whispering as you can hear every single sound inside. Etiquette: You need to put your devices on silent and deposit your shoes near the stairs to the temple. You are free to walk around the temple garden in shoes. How to reach: The nearest metro station is Kalkaji Mandir – it is around 5 walking minutes to the temple. You can also reach the temple from Nehru place in 15 minutes by walk or take an auto. Other tips: Plan out your time. Since it’s a world known temple, there are always big queues. I’ve visited Lotus temple several times and every time spent somewhat half an hour in the queue. There is a concept of the last entry, after which you can’t enter the territory. If you are already inside by the time of the last entry, you have 1-2 more hours to explore it. You can stay inside the temple as long as you like (within the temple working hours). The temple doesn’t work during holidays, official visits and on Mondays, so double check the schedule before going there. It’s one of the most popular Sikh Gurudwaras that attracts millions of visitors each year. Initially, it was built as a bungalow in the 17th century, though it has been reconstructed several times throughout history. Gurudwara is run by volunteers. In addition to the impressive interiors and the peaceful atmosphere, there is a large holy pond outside, where you can see devotees taking a dip. You can visit as well the Langar(food) Hall, where you can eat a traditional meal. Etiquette: You need to take off your shoes, wash your hands and feet in the water area before the entrance and cover your head during all the time you will be inside the Gurudwara. Though there are boxes with scarves near the entrance, I recommend that you bring your stall with you. There is a place where you can donate money, though it is not a requirement. How to reach: It is located near Connaught Place (CP), which is a popular area for dining and shopping. You can go by metro till Rajiv Chowk station and take 5 minutes auto or a walk from there. As a rule, the entry to any temple is free with a few exceptions. I’ve named here only big iconic temples. There are many more great temples in Delhi and I think it takes a book apart to review all of them. Nevertheless, you can also visit Jain temple, Nizamuddin Dargah, Mosque and other institutes to learn about different religious traditions in India. From the architectural point of view, I would also emphasize Isckon temple, Chattarpur temple, Shri Digambar Jain Lal Mandir, Kala Mandir and Birla Mandir. These temples are close to famous tourist attractions in one way or another. It is an official home of the president of India. This complex occupies a huge space and includes several buildings, gardens, and yards. If you take a walk from India gate you will be able to see the exteriors of the part of the complex. If you visit in February-March, Rashtrapati Bhavan opens its fascinating gardens for the visitors for one month. Organizational details: It makes sense to visit both Rashtrapati Bhavan and India gate in one go. They are around 3 km away from each other on a straight line so you will be able to see both of them on the ends of the road. You can either walk or take one of the autos. How to reach: The metro station Central Secretariate(CS) or Udyog Bhawan are the closest to Rashtrapati Bhavan. This monument is also a visit card of Delhi. India Gate is actually a war memorial dedicated to thousands of Indian soldiers who died during different wars of the 20th century. This area is especially beautiful at the sunrise and in the evenings when it’s lit with multicolor lights. I recommend visiting India Gate during the weekdays. On weekends, it’s a popular spot among locals to play sports, go on a family picnic or get together with friends, thus it will be really crowded at that time. How to reach: The closest metro station is the Khan market(violet line). From there you can take an auto rickshaw or walk for 15 minutes. Step wells are the calling from the past. There are numerous wells spread around India, though they get quite often overlooked by the tour guides. Agarsen ki baoli is definitely an offbeat place in Delhi, but if you are interested to know more how people were getting water a few centuries back, consider visiting it. It is located near CP (Connaught Place). The closest metro station is Rajiv Chowk. Chandni Chowk – one of the oldest Indian markets located in the Old Delhi. Khari baori – one of the world famous spice markets located inside Chandni Chowk. You might have not even heard the name of a few spices you can find here. Beware, you can start coughing while crossing the market due to the chilies and other spice powders in the air. Dilli Haat, Lajpat Nagar– if you are looking for clothes and souvenirs, I would choose one of these two markets, though preferably Lajpat. Dilli Haat is more tourist oriented so you can always expect higher prices there. Nevertheless, Dilli Haat is a place to meet many interesting local craftsmen and artists. Now, several people might criticize me why I haven’t included Janpath, GK or Sarojnii. In fact, I’ve skipped many of them. I’ve been visiting frequently over 10 markets in Delhi and, in my opinion, the ones mentioned above, give a fuller representation of the city and local buzz. This park combines the architecture represented by several medieval tombs, pond with birds and over 90 acres of green area for recreation. This is a popular destination for a family picnic on weekends, thus you might want to visit it during weekdays. This is one of the hot meeting spots in Delhi. You can see the fascinating ruins here, a park, where people jog, play cricket or other sports, lake with birds and also a famous hub of fancy cafes and places to hang around. This is a popular area among both locals and expats as it meets the needs of the broader audience. If you are a fan of museums, you will be glad to know that most of the museums in India are Government Institutes. Many of them come free of charge because the government wants to encourage people to visit museums and galleries and find out more about the history and other topics. This ceremony is held since 2012 and every Saturday it is open to the public. If you are visiting Delhi on a weekend, consider adding this experience to the list. You need to take an ID with you. India Habitat centre organizes various cultural events with free entrance. From music concerts to photo exhibitions, they give visitors the opportunity to learn something new from another culture. I love the cultural and art performances, visited quite a few and recommend events organized by India Habitat centre. If you wish to be part of the fit tribe, every Sunday early morning there is a huge gathering of people in CP (Connaught Place). You will find many activities there – from yoga to dancing. If you wish to get fit in a big company of people, join Rahgiri every Sunday from 6 a.m. If you love parties, there are many famous clubs that grant free entry for women. There are also special days when everyone can enter certain clubs till 10 a.m. for free. Typically the clubs close by 1 a.m. – government formality. In any case, take care of your transportation back home in advance and take the opinion of the local people about the place you are heading to. If you are a solo traveler, I recommend finding a company for evening outings. Here you are, even if you are traveling on a tight budget Delhi still has a lot to offer you! Have you ever visited Delhi? If so, are there other free interesting activities to add to this list? Share the post "13+ interesting activities and places in Delhi you can visit for free"